Before I purchase anything on eBay, I first search for completed listings to see what the item I'm interested in sold for in the past. This is a free service provided by eBay and in my opinion very powerful research tool for any buyer. This can also be used to do research before selling but let's stick to buying in this post. Prices for items that actually sold are shown in green and the ones that did not sell are in red. 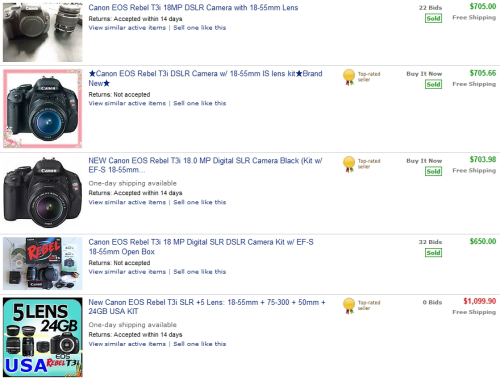 By default eBay sorts items by end date (most recently ended listings are on top). If you'd like, you can also sort by price or distance from you. There are a lot of other filters you can apply on the left side such as category, condition, price range. You can explore those by yourself. By looking through ended listings, you can figure out what to expect to pay for the item and you can also see the price range from low to high. This way you're an educated buyer and you will not overpay by getting caught up in the bidding war. Once you know the price range, you can start searching for your item. Just remember to search for both auctions and Buy It Now items as you never know where you find good deal. If you'd like, you can try eBay software that I created called Buyer Auction Manager. It will help you find great deals and save you money. 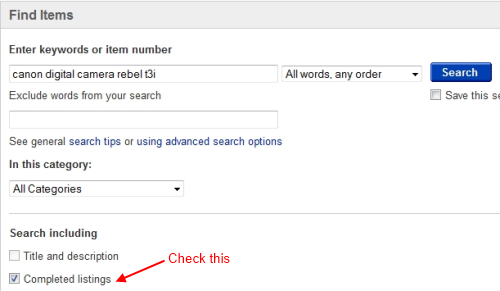 Before you buy anything on eBay, do your research by using completed listings search. This will give you a good idea of the price. eBay doesn't always have the best prices. Seller fees are high those days and you as a buyer end up paying those fees because sellers pass them over to you. Make sure you check other places. I usually use Google and Amazon search just to make sure I'm not paying too much on eBay and often choose other places to purchase my items.